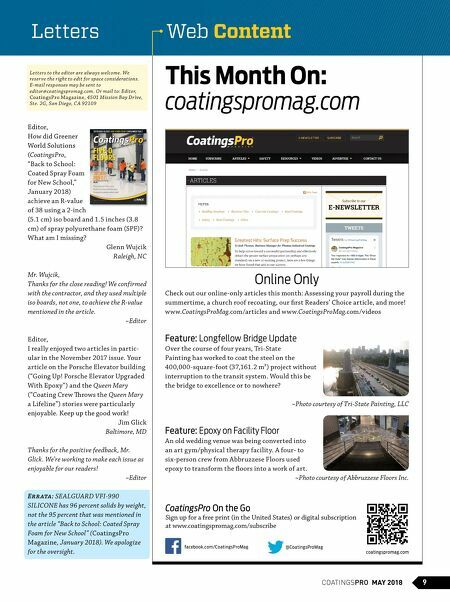 8 MAY 2018 COATINGSPROMAG.COM CoatingsPro, May 2018 Volume 18, Number 3 is published six times per year with one special issue annually for a total of seven for free to qualified subscribers by NACE International, 4501 Mission Bay Dr, Suite 2G, San Diego, CA 92109. Postmaster please send address changes to PO Box 16495, North Hollywood CA 91615-9942. © All contents copyright 2018 by NACE International. This publication allows its authors the fullest latitude in expressing opinions on controversial subjects so that its readers will be better informed. The views and conclusions expressed in this publication are those of the authors and not necessarily those of this publication. There is no warranty as to the legality, completeness or accuracy of the information contained herein. Reproduction in whole or in part of any part of this publication without the prior written consent of the publisher is prohibited. Editorial contributions are welcome. Publisher reserves the right to use materials at his discretion, and reserves the right to edit material to meet the publication's requirements. Contributor's act of sending a contribution shall constitute an express warranty that the material is original and does not infringe on the rights of others, and that the publisher is granted every right to reproduce said material. Group Publisher Bill Wageneck, bill.wageneck@nace.org, +1 281-228-6441 Associate Publisher Eliina Lizarraga Editor Stephanie Marie Chizik Technical Editor Malcolm McNeil Contributing Editor Jack Innis Staff Writer Ben DuBose Product Manager, Electronic Media Husna Miskinyar Contributors Brad Bischel, Phil Camp, Ted Curley, Kate Kauffman, Jennifer Frakes, David Hunter, John Petersen, Andy Slipher, Nicholas White, Christa Youngpeter Copy Editors Julie Berr y, Robin Cheslock Editorial Advisory Group Daniel Ash (Flowcrete Group Ltd.), Robert Nash, Jr. (Greener Blast Technologies, Inc.), Branwyn Rhodes (BrandSafway), David Welte (GreenPROChicago, Inc.), Roland A. Vierra (FLOORING FORENSICS Inc.) Art Director Rey Galza ADVERTISING SALES Sales Manager Diane Gross diane.gross@nace.org, +1 281-228-6446 Account Executive Jody Lovsness jody.lovsness@nace.org, +1 281-228-6257 Account Executive Daniel Vincent daniel.vincent@nace.org, +1 7 70-437-0861 Account Executive Eric Freer eric.freer@nace.org, +1 281-228-6292 Advertising Coordinator Brenda Nitz brenda.nitz@nace.org, +1 281-228-6219 DIRECT LETTERS, EDITORIAL QUERIES, COMMENTS, AND PHOTOS TO: CoatingsPro Magazine 4501 Mission Bay Dr., Ste. 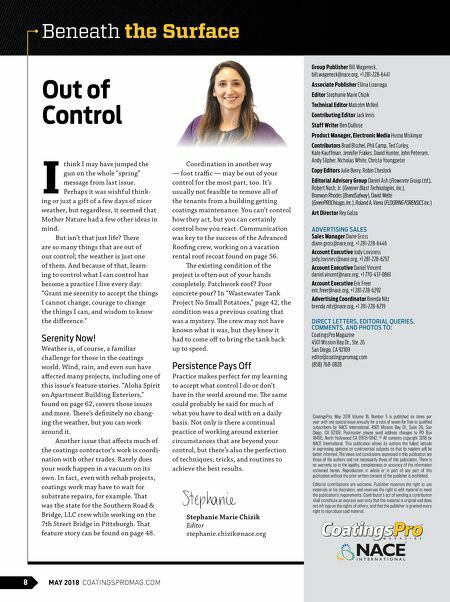 2G San Diego, C A 92109 editor@coatingspromag.com (858) 768-0828 Beneath the Surface Out of Control I think I may have jumped the gun on the whole "spring" message from last issue. Perhaps it was wishful think- ing or just a gift of a few days of nicer weather, but regardless, it seemed that Mother Nature had a few other ideas in mind. But isn't that just life? ere are so many things that are out of our control; the weather is just one of them. And because of that, learn- ing to control what I can control has become a practice I live every day: "Grant me serenity to accept the things I cannot change, courage to change the things I can, and wisdom to know the difference." Serenity Now! Weather is, of course, a familiar challenge for those in the coatings world. Wind, rain, and even sun have affected many projects, including one of this issue's feature stories. "A loha Spirit on Apartment Building Exteriors," found on page 62, covers those issues and more. ere's definitely no chang- ing the weather, but you can work around it. Another issue that affects much of the coatings contractor's work is coordi- nation with other trades. Rarely does your work happen in a vacuum on its own. In fact, even with rehab projects, coatings work may have to wait for substrate repairs, for example. at was the state for the Southern Road & Bridge, LLC crew while working on the 7th Street Bridge in Pittsburgh. at feature story can be found on page 48. Stephanie Marie Chizik Editor stephanie.chizik@nace.org Coordination in another way — foot traffic — may be out of your control for the most part, too. It's usually not feasible to remove all of the tenants from a building getting coatings maintenance. You can't control how they act, but you can certainly control how you react. Communication was key to the success of the Advanced Roofing crew, working on a vacation rental roof recoat found on page 56. e existing condition of the project is often out of your hands completely. Patchwork roof? Poor concrete pour? In "Wastewater Tank Project No Small Potatoes," page 42, the condition was a previous coating that was a mystery. e crew may not have known what it was, but they knew it had to come off to bring the tank back up to speed. Persistence Pays Off Practice makes perfect for my learning to accept what control I do or don't have in the world around me. e same could probably be said for much of what you have to deal with on a daily basis. Not only is there a continual practice of working around exterior circumstances that are beyond your control, but there's also the perfection of techniques, tricks, and routines to achieve the best results.